In the back of the sanctuary, sitting on hard wooden chairs, they gathered. Young men, professors, professional women, students and retired sat in a talking circle following a lecture and wondered about how the world and God engage each other. create boundaries of ethics and expect actions with responsibility. People from many points of view spoke, reflected and listened to each other, the agreed respect carried the conversation shaping and guiding the process. Seekers, agnostic, progressive, conservative, Christian and Jew sat together. And the vision of Faith & Science in Dialogue: The Rheticus Forum became a lived reality. 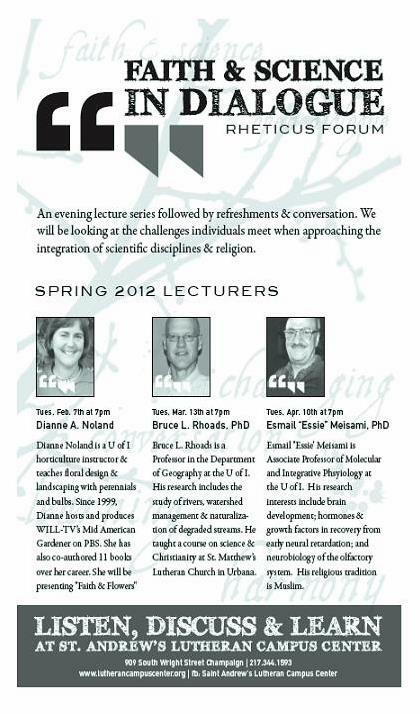 Based on this successful beginning, the series of lectures integrating issues of Faith & Science in Dialogue: The Rheticus Forum will continue into the spring of 2012.
encouraged questioning, and honest doubting all within a community of supportive mentors. Please join us for these lectures as you are able and hold the process in prayer as God leads us more deeply into this vision of ministry. This entry was posted in Musings on January 31, 2012 by lutherancampuscenter.